iOS: The Megacool SDK supports iOS 7+, but GIF capturing is only supported on iOS 8+. Android: The Megacool SDK supports Android API level 16 (4.1.x, Jelly Bean) and up. Recording is only from API level 18 and up. Set up your app on the dashboard to receive the required keys for the SDK. After you're done, refresh this page to see your keys in this guide. Download the Unity package and import it to your project through Assets -> Import Package -> Custom package. You're not logged in, log in to see app configuration for your apps here. Press Save changes when you're done. Make it easy for players to share your game to their friends. 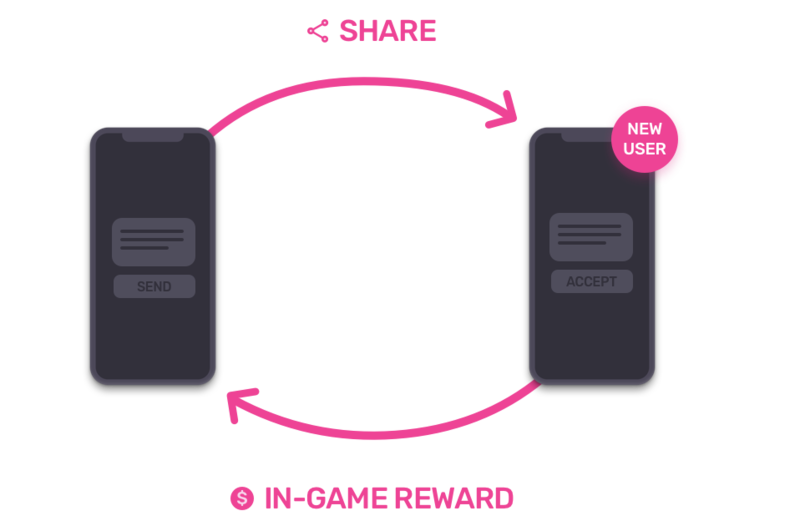 Incentivize players by rewarding them for each share they send that leads to a new friend installing the game. Note: The callbacks are registered before Megacool.Instance.Start() to ensure all events are handled. This opens a share modal with a link to your game that lets players refer friends through any channel available on their device. Read more about referrals and how to test it here. The recording will keep a buffer of the last 5 seconds by default. Old frames get overwritten by new frames. The next time you call Megacool.Instance.Share, the latest recording will be included in the share together with the referral link. Read more about how to customize recordings here. Note: Make sure your game has a main camera, as we'll fall back to recording from that on devices that don't support direct capturing from the screen. Alternatively you can select a custom camera to use by following these steps. Fallback media is used in cases when there’s no recording or if the recording has failed. The fallback media can be JPEG, PNG, GIF or even MP4. For historical reasons, the SDK refers to it as FallbackImage. When choosing your media file please keep in mind that there's a size limit for some social media platforms, so try to stay below 3MB. Note: Fallbacks also need to be set on the server-side for the best experience, but we don't have an automatic way to set these yet. Contact us if you want this and we'll help you get it sorted. Build your project to a device and run it! Note: In case you have another SDK that also subclasses the UnityAppController, you have to merge MegacoolAppController to make link handling work for both. Check out an example merge with Tune SDK (TuneAppController.m): MergeUnityAppController.m. Remember to delete the original files after merging into a new file. We strongly believe in not crashing your apps. But, since networking and computers are inherently unreliable, stuff sometimes fails. To prevent your users from noticing these failures, you should always be prepared for our API calls to return nil or other signals of failure, and have a plan if that happens. This can happen if your app runs out of memory, disk is full, or some other bug is present which prevents us from delivering the expected value from our API calls. We believe in the philosophy of progressive enhancement, and this is your best way for interacting with our API as well. In practice, always assume that our tools fail, but rejoice when they are working as promised.